Corruption had deprived the Roman Catholic church of its credibility during the last centuries of the middle ages. The reformation of the church in Switzerland by Huldrych Zwingli, John Calvin and Guillaume Farel came a little later than the reformation in Germany by Martin Luther, but it did have a certain independence and it was more radical. As in Germany, the Reformation began in Switzerland as a religious renewal movement and ended in a deep political division between the progressive cities of northern and western Switzerland and the conservative rural areas of central Switzerland. In reformed regions moral behaviour of the population was soon controlled more strictly (and hipocrisy flourished as well ...) while in catholic areas joy of living, sensuality and public amusements like dancing were more likely to be tolerated. On the other hand the Reformation did not bring about more freedom, neither privately (freedom of conscience or religion) nor politically (democratic rights). Though demands of this kind were raised repeatedly, freedom in a modern sense was not granted until the 19th century. The wealth of the church had lead to spiritual shallowness and demoralization of the clergy. In Germany every 9th inhabitant was a member of the clergy. Though the church officially demanded for celibacy of the clergy, most clergymen had more or less clandestine sexual relations to women. Once even a illegimate son of a pope was elected as pope. High clerics (bishops, abbots, canons), often delegated their pastoral duties to uneducated vicars to have more time for a luxurious life or at best for studies. A tendency to transform the churches instruments of salvation into legalism and profit: the personal confession to a priest (with spiritual guidance) had been turned into a system of preaching torments of hell, imposing severe penitence and selling indulgence. Scholastic theology had become a sterile repetition of formulae and this affected also divine services for the population. Numerous attempts of reforms to the system of the church (for example by councils or by the orders of mendicant friars) had not produced durable results: the Roman Catholic Church remained too corrupt from the head (pope) to the priests in the villages. The strict doctrine contrasted too much to the reality of the life of a big part of the clergy. Still more, the doctrine had just been contested by the Renaissance scholars having discovered old manuscripts of the bible in original greek language (instead of latin). Their studies were based on the original texts rather than on the comments by the church fathers. Though quite different in terms of attitude, lifestyle and focus, Humanism and Renaissance provided an important framework for biblical studies that were to become essential for the Reformation. Humanism as a new intellectual movement came from Italy. Centers of the humanistic movement were Venice, Florence, Milan, Ferrara and Rome. Towards the end of the 14th century the eastern part of the Roman Empire came under pressure by the Arabs. Scholars, philosophers and poets emigrated from Constantinople to Italy and took libraries full of books with them - greek books that had been forgotten in Western Europe after Germanic tribes had set an end to the western part of the Roman Empire around 400 A.D. The specific medieval form of theology, scholasticism, that was based alone upon the church tradition, was questioned. The new impulses also caused a change in the way people felt about life: the medieval "viator mundi" [pilgrim on earth striving for heaven] was transformed into the "faber mundi" [creator and ruler of the world]. The "uomo universale" was the new ideal - a personality overall educated, knowing to be in harmony with nature and "capable of everything if he only wants to": universal genius Leonardo da Vinci (1452 - 1519) is the almost perfect incarnation of this uomo universale. Renaissance lifestyle found visible expression above all in architecture, pictorial art (Raffael, Michelangelo, Botticelli) and music (pure instrumental music: Orlando di Lasso, Palestrina). It took some time until Renaissance art and lifestyle found their way from Italy over the Alps to northern Europe. Hans Holbein jr. (1497 - 1543) was a famous German Renaissance painter, he lived in Basel from 1519 to 1532. Theatre flourished as well - Great Britain's William Shakespeare (1554 - 1616) stands for it. In Switzerland there was no no poet of the rank of Shakespeare, but national hero William Tell provided the story for popular plays critically illuminating local politics. Both reformed and catholic couter-reformed moralism gave a pretext to ban theatre, however, 1616 in Lucerne, 1617 in Geneva, 1624 in Zurich, as the actors representing wicked persons alledgedly "would be captured by exactly the vices they represented" as a contemporary moralist lamented. The foundation of the University of Basel, the first (and until the 19th century the only university in Switzerland) was a by-product of the church council held in Basel (1431 - 1449). The presence of numerous scholars coming from all over Europe to attend the council created the necessary atmosphere. The university began teaching theology and right already in 1432, the formal foundation with pontifical permission was however delayed until 1460. Important progress in the field of medicine is owed to Theophrastus Bombastus of Hohenheim, better know as Paracelsus who worked as a city physician in Basel from 1526 - 1528. Erasmus of Rotterdam (1467 - 1536), an important humanist scholar, lectured in Basel from 1514 - 1521, 1524-29 and 1535 - 1536. Erasmus was seeking a balance between the new humanistic spirit and christian piety. His chief work was a scientific edition of the New Testament in the original greek language with annotations on different handwritings giving slight variations of the text (1516). This edition was the base for scientific bible research and for the first bible translation into German by Huldrych Zwingli and his team in Zurich and by Martin Luther in Germany. The diffence of approach between Renaissance Humanism and Reformation is best illustrated by the controversy of Erasmus of Rotterdam vs. Martin Luther on human freedom: humanist Erasmus published the humanistic point of view under the title "De libero arbitrio ..." [about the freedom of will] (1524), reformator Martin Luther answered with "De servo arbitrio" [about the slavery of will] (1525). Erasmus remained catholic. In Germany, Martin Luther (1483 - 1546) had a conversion experience during a thunderstorm in 1505. He joined a monastery, studied theology and became professor of Bible interpretation in 1512. His personal question "How do I get a gracious God?" drove him into intensive Bible studies. In the letters of St. Paul he found his answer (1513): a person entangled with guilt does not attain justification [release before God's trial] through effort of will or good works, but rather through grace of God alone [grace=unmerited favour]. In Germany the writings of Luther lead to a dramatic increase of book production, his pamphlets carried his ideas to a broad public. In 1521 emperor Charles V. held a Reichstag [medieval kind of parliament] at Worms. Luther thought his theses would be discussed there, but all the emperor did was to ask Luther to recant - because he knew that the reformation would have no chance in Spain an he did not want to have the empire split. So Luther was outlawed, but this remained without effect because Luther was protected by Frederick the Wise. Trying to rely on power alone and failing to resolve the obvious and severe problems of the medieval church by arguments and by real reforms, the emperor inevitably got what he had wanted to prevent: a division of his empire and of western christianity as a whole. In 1522 Luther's German translation of the New Testament was published. At the time there was no standard German language, but rather a large variety of dialects. Luther's bible translation had an important influence on unifying the German language, but in regions remaining catholic this did not take place until the late 18th century when poets like Goethe and Schiller used Luther's standard language. In Germany, many dukes adhered to the reformed beliefs, monasteries were closed and church property nationalized. Luther married a former nun in 1525. Many priests did likewise, according to St. Paul's admonition: it's better a man gets married instead of being unable to live in real celibacy (1 Cor 7,9). When Luther came out in 1525 with his sharp polemic de servo arbitrio against the humanistic conviction that every person has a free will (described by Erasmus of Rotterdam: De libero arbitrio), many humanists turned away from Luther and his reformation. What Martin Luther had preached in Germany (as early as 1517), Huldrych Zwingli taught in Zurich (as early as 1523), and even more radically. By 1525 the reformation was firmly established in the city of Zurich. Guillaume Farel preached the reformation starting 1526 in Aigle, Neuchâtel, Morat, Grandson, Orbe and finally Geneva (1532) where he met John Calvin in 1536. It was Farel that had done most for the spreading of the reformation in French-speaking Switzerland, but John Calvin is better known for his doctrine (Christianae Religionis Institutio, published in Basel, 1536) and for the strict organization of the church in Geneva (where Farel had failed). The doctrines as well as the organization of the reformed church by John Calvin influenced reformed churches all over the world, especially in the Netherlands, in Scotland and in the United States of America. While Zwingli and Luther could not find a common position in the question of the interpretation of the Lord's Supper, John Calvin and Henry Bullinger (Zwingli's successor after his early death in 1531) came to an agreement in 1549 (Confessio Helvetica Posterior). Between 1524 and 1529, Huldrych Zwingli, Leo Jud, several former canons [canon = priest being important member of a bishop's administration] and printer Christoph Froschauer published the "Zürcher Bible". This first German translation of the complete bible (Old and New Testament) by the Swiss team in Zurich was finished five years before Martin Luther's famous "Wittenberg Bible". The Reformation spread from Zurich to the rural areas dominated by Zurich and to other parts of eastern and northern Switzerland very quickly. The followers of Zwingli established the Reformation in the city of St. Gallen (1527), in Berne (1528), Schaffhausen (1529), Glarus, in the outer district of Appenzell and in Toggenburg. But Zwingli did not only attack the corruption of the church, he was also an embittered opponent of mercenary troops (soldiers fighting professionally in the service of a foreign power). Mercenary troops were a most lucrative business for central Switzerland, however, and there was barely any other business chance available in this over-populated region at the time. Zwingli's strict opposition to mercenary troops was based on his own experience as an army chaplain with Swiss troops in northern Italy. No doubt this controversy was a major reason why central Switzerland did not adhere to the reformed beliefs. On a 1526 Swiss conference on the reformation in Baden (Aargau) the rural regions remaining catholic were still in a majority. In Basel, Zwingli's friend John Oekolampadius could introduce the Reformation in a single church while others remained Catholic. By 1529 there was a reformed majority of citizens, but the city council still hesitated and was forced with weapons to introduce the new beliefs in all churches of Basel. Altars and pictures in the churches were destroyed with raw force in most reformed areas of Switzerland. Some fresco paintings on church walls were simply painted over with white color and have been restaurated in the second half of the 20th century. In Grisons (south-eastern Switzerland) three political alliances had been established towards the end of the 14th century. These alliances united against the secular [wordly, political] authority of the bishop of Chur in 1524. Many communities in Grisons joined the Reformation until 1526. The Bernese government gave permission to the Frenchman Guillaume Farel de Gap in 1526 to preach in the Vaud region (western Switzerland, subject partly to the dukes of Savoy, partly to Berne). Farel carried the ideas of the Reformation to Neuchâtel, Murten, Grandson (1530) and finally to Geneva (1532). Zwingli was more radical than Luther in many points. Though both agreed that the catholic church had emphasized too much the administration of the seven sacraments [ritual celebrations thought to be showing and effecting the grace of God in a person] and that only two could be found in the Gospel. But while Luther accepted everything in church tradition that was not explicitly contrary to the scriptures, Zwingli interpreted Luther's principle sola scriptura: [only the biblical writings (not the tradition of the church)] strictly: Zwingli said that every ritual not explicitly mentioned in the Bible should be abolished, and so he did with five of the seven sacraments - only Baptism and the Lord's Supper were kept up in Switzerland's Reformed Churches. While Luther wrote himself dozens of hymns to transport the protestant convictions into the hearts of believers, the Swiss churches regarded hymns as unscriptural and provided metrical translations of the Psalms instead. Still more controversial was the interpretation of the Lord's Supper: Both Luther and Zwingli agreed that the catholic mass (celebrated in latin language until 1967, so that common people would not understand] was a source of much popular superstition and both wished to eliminate the notion of sacrifice (as if the church could contribute anything to salvation) as completely contrary to the reformed principle of sola gratia [all salvation due to God's grace alone]. But while Luther, being a pious man aware of his roots on the countryside, still belived in the mysterious real presence of Christ in the bread and wine of the Lord's Supper, Zwingli as an intellectual sharply distinguished the material from the spiritual and was horrified of the idea that "physical objects might be the vehicles of spiritual gifts." (Chadwick, Reformation, p. 79). Martin Bucer (1491 - 1551), the reformer of Strasbourg, tried to reconcile Luther and Zwingli and to finde a common protestant platform at a conference in Marburg in 1529. Zwingli and his friend Oekolampad from Basel stuck to their purely symbolic interpretetation of the Lord's Supper as a memorial and thanksgiving, but not as a means of grace. Why should the Bible text "This is my body" be taken more literally than other sayings of Jesus like "I am the door" or "I am the vine"? "Luther thought that Zwingli was depriving the faithful Christian of that comfortable assurance promised in the Gospel, and that he was applying rational argument to a mystery beyond all argument. He could not regard the Swiss as faithful men." Bucer proposed a compromise: "The divine gift was not given in or under the forms of bread and wine - thus far Zwingli was right. But it was given in an indissoluble conjunction with them - as the bread is given to the body, so the divine gift passes into the faithful soul. ... Therefore Luther was right in contending that an objective gift was offered to the communicant, and Zwingli was right in contending that the faithless man could receive nothing but bread." Bucer failed to reconcile Luther and Zwingli, but later his proposal became the classical doctrine of the Reformed [non-Lutheran protestant] Churches, known as receptionism. (Chadwick, Reformation, p. 79-81). The Reformation encouraged also that everybody would read the Bible himself (instead of just listening to sermons) and would have his own thoughts about it. In Zurich, a community of Anabaptists was founded. The Anabaptists did not accept baptism of children but insisted on a deliberate decision of every single adult person to become a member of the christian church. Adults who converted to these beliefs were baptized once again. Zwingli did not support this view and the city council of Zurich banned the Anabaptists in 1526. Some of their leaders were even executed and remaining banned from the city. So the new protestant freedom was not so big, evidently ... Many Anabaptists from all over Europe emigrated to North America from the 17th century on in order to escape from religious intolerance. In periods of crisis heterodox people were always the first to be struck economically. The reformation divided Switzerland in two fractions: the progressive cities (Zurich, Basel, Berne, Geneva, Neuchâtel) turned towards the new confession and enforced conversion also in their subjected territories, while conservative central Switzerland (including Lucerne) remained catholic. The controversy between Zurich and Central Switzerland on the preaching of the reformation in the subject territories under common administration (eastern Switzerland) and about mercenary troops lead to the two civil wars of Kappel (1529 and 1531). Reformer Huldrych Zwingli was killed on the battle field in 1531. The confessional division provoked also the civil wars of Villmergen in 1556 and again in 1712. French jurist John Calvin (1509 - 1564) was banished from Paris because of its open partisanship for the Reformation in 1533. When Calvin traveled through Geneva in 1536 he had no intention to stay, but Farel convinced him to do so. Farel had failed 1532 in a first attempt of reformation due to the resistance of the citizens of Geneva, he returned however in 1533 under the protection by Berne. Berne threatened to stop support against the dukes of Savoy if Geneva would reject the reformation. The bishop of Geneva sympathizing with the dukes of Savoy was banished in 1533. Calvin was not able to move a majority of Geneva's cititzens to accept his severe church order. After a dispute about the form of celebrating the Lord's Supper, Calvin and Farel were banished from Geneva in 1538, but called back in 1541 after re-elections to the city council. Calvin reformed the structures of the church church by imitating the primitive church as described in the New Testament. He tried to strenghten the indepence of the church from the state (pastors chose pastors and teachers), even if the Geneva city council insisted on its right of ratification. Elders had to survey the moral conduct of every single citizen and even to visit every home once a year. Severe rules interfered deeply with personal freedom and forbade all luxury, usury, games, dancing and other amusement. Calvin consolidated his influence by naturalization of French fugitives. In 1555 a revolt of many old-established Genevan families failed. As we have seen, Calvin's doctrine of predestination had anything but a fatalist effect on the discipline of his followers - and this remained true for centuries. In the 19th century, sociologists found, that calvinist believers all over Europe were not only more inclined to an ascetic way of life than lutherans and catholics but would as well be more eager for higher education, more inclined to choose professions closely related to the capitalist / industrialized way of economy (compared to catholics preferring conventional professions) - and all to a statistically significant degree. German economist and sociologist Max Weber (1864 - 1920) tried to find the missing link in his famous treatise Die protestantische Ethik und der Geist des Kapitalismus [protestant ethics and the spirit of capitalism]. Max Weber's thesis remains disputed among scholars, however, until today. The Catholic Church had tried to enforce adherence its doctrine by burning so-called heretics [people teaching different doctrines] during the middle ages. Those who would expect that the Reformed Church would bring about a real change here, must be confronted with a sad reality: Nothing really changed. Switzerland's Reformed Church was as intolerant and cruel as the Catholic Church had been. In 1553 Michel Servet, a well known physician, that challenged the Trinity of God, fled from catholic prosecution in Lyon (France) to Geneva hoping to find refuge. But Calvin insisted on the death penalty for this heresy. During an epidemic of pestilence from 1542 - 1546 in Geneva 58 women and men, suspected of being witches, were sentences to death as well. Witch-hunting reached a sad top level towards the end of the 16th century, alone in the reformed Vaud region over 300 women were burnt after cruel tortures for being witches between 1590 and 1600. Similar numbers were counted in catholic regions. Only in Basel the influence of the university tempered witch-hunting a little bit. On the other hand, Geneva, Neuchâtel and Basel became centers of asylum for many Huguenots (persons of reformed belief in France) and of other reformed refugees from Italy, Spain and Great Britain (after the inthronisation of the catholic queen Mary I. in 1553). As many of these refugees were skilled goldsmith's, watchmakers or bankers, western Switzerland became a center of watch making and banking. In Italy and Spain religious national feeling, prosecution of rebels by the church (inquisition) and moderate reforms of the catholic church prevented a Reformation. For a long time, neither the pope nor the French king were interested in a general reform council, while the German king Charles V. (at the same time being king of Spain) insisted that a council, if at all, should meet on German territory. Finally the reform council (Tridentinum) met in Trent (Northern Italy, then formally part of the German empire) from 1545 to 1563. But the catholic clergy was not willing to discuss any basic issues - neither the problems of church organization nor the theological questions about scriptures vs. tradition and faith in grace vs. sacraments. To the contrary, the catholic doctrine was confirmed. The council of Trent gave sign to a spiritual counter-attack, however. The Jesuit order, established in 1534 by the Spanish officer Ignatius of Loyola was the leading force in the catholic counter-reformation. In Switzerland, the Counter-Reformation was put forward by Carlo Borromeo (1538 - 1584), a Jesuit and archbishop of Milan. 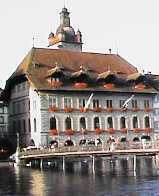 On Borromeo's initiative, Lucerne provided a building where the Jesuits established a college in 1577. Baroque architecture with its monumental splendor reflects the recovery of catholic strength. 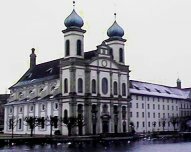 The Jesuit church in Lucerne (picture to the left), erected from 1666 - 1677, is the first large baroque church in Switzerland. Dutch Jesuit Petrus Canisius (1521 - 1597) wrote a Catholic Catechism [textbook for the religion class in the form of questions and answers] in 1555. He was appointed director of the Jesuit college of Fribourg (western Switzerland) in 1580. His Catechism was nick-named Canisi in Switzerland and was used until about 1970. The reformed church reacted with the Heidelberg Catechism of 1563. Pope Gregor XIII organized a calendar reform in 1582. Because the calculations of the old Romans had not been very precise, the Julian Calendar valid since 46 B.C. leaped behind the effective position of the earth turning around the sun for 10 days until 1582. The Gregorian reform eliminated the accumulated error and refined the rules for inserting leap years in order to avoid the mistake in the future. In Switzerland the reformed areas kept to the old calendar until 1701 purely out of a anti-roman reflex. In orthodox Russia the calendar was still used even in 1917, for this reason the communist revolution is called October Revolution - though according to the Gregorian Calendar it took place in November 1917. Internet Modern History Sourcebook: The Reformation (Paul Halsall, Fordham University) - provides access to thousands of historical sources!